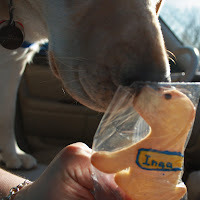 Inga's report for her first month in AT (advanced training) at CCI came in this week. Of the six to nine months of AT, it's the first month that's the biggest adjustment for the dogs. They've moved into a entirely different environment while being introduced new behaviors. 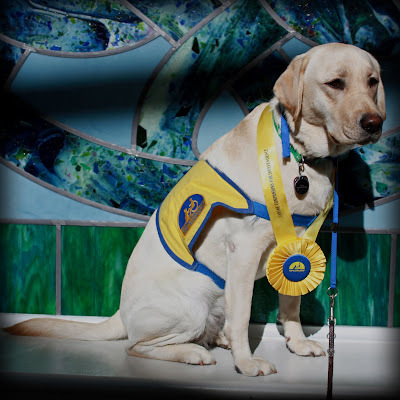 So as a puppy raiser, it's not good to get your hopes up too high when you get that first report card. Inga is the first CCI puppy that I raised. I was told to expect to see her react in different ways than when she was with me -- and that is indeed true. Her already dominant personality is now a bit elevated with her CCI playmates and her trainer says she is easily distracted. This may be just a maturity issue, but of course this could also be just who she is. Her trainer will be working with her over this second month and we'll get a better idea by the end of January. Regardless, anyone can see this is an amazing dog. Whatever Inga decides to do, in the end she will change someone's life for the better. We just have to wait to see how. My life has changed profoundly just having been her puppy raiser. This month's AT report came early due to the holidays. The next update won't be until the end of January. I'll have to be patient over this long wait. Keeping my fingers crossed that she hits her groove before then. The photos for this post are Inga wearing her rosette at her matriculation in November (top) and getting a snootful of her personalized cookie made by fellow puppy raiser, Esther (right). Esther generously makes these cookies for all the matriculating pups. It looks absolutely yummy, but I don't have the heart to actually eat the thing [~sniff~]. I'm sure Esther understands. The joys of . . . oh crap.